History & Tradition of St. Michael - St. Clement School in Overlea, Md. St. Michael the Archangel School and St. Clement Mary Hofbauer School have long been anchors in the communities of Overlea and Rosedale, respectively. St. Michael's School opened its doors in 1926 under the direction and administration of the Ursuline Nuns. In later years, the Daughters of Charity would continue the work, maintaining an academic service oriented legacy. As the school began to grow and flourish under the guidance of the faith filled community, a second building, St. Catherine Labouré Hall was constructed to meet the growing demands of the student population. Originally founded in 1932 by the Franciscan order, St. Clement Mary Hofbauer School has been a stable and consistent presence in the Rosedale Community. Established with an education rooted in the richness of Catholic tradition and teaching, St. Clement Mary Hofbauer School serves students in the immediate community as well as the surrounding counties and city. An addition to the school was erected in 1953 to accommodate the burgeoning student body. The multi-generational families attest to the resiliency of these schools and the efforts to rise above faced challenges and transformations. Both schools serve a diverse multicultural and multi-faith population which enriches understanding of a global environment. The willingness of countless alumni to serve, volunteer, and give back to each school allows for continued growth and service to the Archdiocese and the surrounding communities. In July 2017, on the St. Michael campus, these two schools consolidated and opened their doors as the new St. Michael - St. Clement School, bringing together their two rich histories of providing a faith based education to students in PreK3 through grade 8. Each student at St. Michael - St. Clement School will develop unique talents and individual academic skills guided through Gospel teachings. Students will engage in service learning opportunities wherein an appreciation for the social, ethnic, and cultural backgrounds of all people will be emphasized. Recognizing the individuality of each child, provisions will be made to meet the needs of all students. 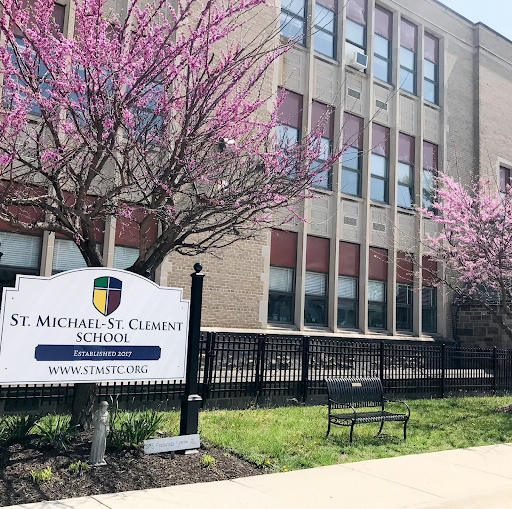 St. Michael - St. Clement School is an Archdiocesan Collaborative School (ACS) which utilizes a shared governance model that fosters unity through the collaboration of stake holders in support of Catholic schools. Information and communication technologies will afford students the opportunity to interface with a rapidly changing world allowing them to interact with both local and global agencies as they solve real world problems through inquiry based learning. St. Michael - St. Clement School is creating a new history in the Southeast Baltimore area. Their vision of unification in continuing to provide excellence in education in a faith filled environment will endure as each school community collaborates in a positive partnership to enhance the educational process. An exciting new consociation with a welcoming atmosphere and familial environment will add to the presence of the school in this area. An inexpressible feeling of warmth and acceptance awaits each visitor, parent, and child who enters the doors. In honoring our past, we will be uniting for our future.